14 Comments This post may contain paid and/or affiliate links. Please see our disclosure policy for further information. As a blogger, we use affiliate links to help us earn a living. But when you've worked hard to build an audience, the last thing you want it to think is that your only purpose is to sell something! 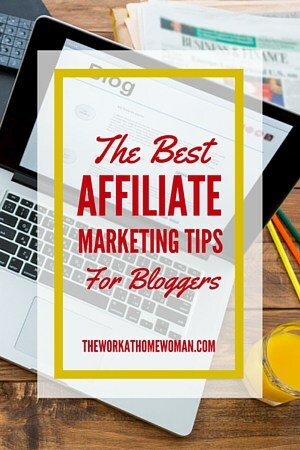 That's why we're sharing the best affiliate marketing tips for bloggers with you today! To start, let's break down what affiliate marketing is (then we'll get to the tips!). Affiliate marketing, if done the right way, is like telling a friend about something you love. There doesn't have to be pressure or salesy talk – no gimmicks, just ‘this is the product, and this is how it worked for me' type dialogue. Those are the bloggers that rock the affiliate marketing space – the ones who are honest about what they use, how they liked it and can talk about it straightforwardly and sincerely as if they were chatting with you over coffee about the latest and greatest product or service they discovered. But what kinds of things can you promote as an affiliate? Here are some examples. Ebooks – These are so easy to include thanks to sites like Amazon and Commission Junction. They provide you with a unique tracking link to include in your post, and you can even use pictures off the site. For me, this is a no-brainer since I love books, so recommending ones I like to my readers comes naturally. Maybe you enjoy the feeling of a book in your hands and turning the crisp, new pages (or maybe that's just me). The cool thing about promoting ebooks is that through platforms like Amazon there is also the option to buy a physical book. Printables – Printables are all the rage right now. There are bloggers out there who are making more than half of their income (or more!) selling printables, both their own and from others. Usually, bloggers who are selling their own have an affiliate program in place which will allow you to sell their printables too and get paid for doing so. Online shopping – With so many options for shopping online, the sky is the limit here. Not only can you become an affiliate for big box stores like Target but also for independent small business owners like the shops on Etsy, for example. You can earn money off of everything from luxury, personalized, and handmade gifts to toothpaste and toilet paper. My newest favorite that I recommend personally is Grove Collaborative. Grove not only is an excellent shop that saves me tons of time by sending just what I need right to my door (bye-bye unnecessary shopping trips, yay! ), but they allow me to earn a commission when I recommend them to my audience while consistently offering new discounts and freebies to my people. There are many ways to promote affiliate items, and the best rule is that it should fit easily within the content of your site. For example, if your blog is primarily focused on finances, you might not promote something along the lines of a DIY craft product. Then again, you might; only you can decide what fits within your niche (if you have one). If you're a lifestyle blogger or write about several different topics, there's a good chance you'll be able to promote a wide variety of products and items. So what is the best way to share affiliate links? Blog Post – One of the most used methods of promoting affiliate links is simply to write a blog post and include your affiliate link. There are a couple of ways to do this, and to be honest, I don't think there's one right way. It just depends on your site and your audience. One is to write an entire post about the product or service. To some, this might seem like a salesy and purely promotional method, but that's necessarily true. If you are focusing on a product or service and sharing how it has helped, influenced, or contributed to your life in some way, it can come across as a natural way to share what's working for you. The second is to write a post like you normally would about something and then tie in affiliate links where appropriate. For example, maybe you're doing a post about cleaning your kitchen. You could include your favorite dish soap, scrubber sponge, and counter top cleaner. You don't even have to talk about it much, a simple ‘This is what I use to get the sticky mess off my countertop daily, and it works amazingly!' with a link included to your favorite product will do. Banners or Sidebar Ads – Another great way to promote your affiliate links is to place a banner or a sidebar ad on your blog or website. Companies like Wayfair, Etsy, and Ashley Home Stores make it easy by providing you with multiple options to use, and it's fairly easy to swap them out to advertise an upcoming sale or when you just want something different. Email Newsletter – As a blogger, I'm sure you have your own email newsletter, am I right? (If not, see here about setting one up for your blog). So why not use it to share the products you like the most with your audience? Email newsletters can be more personal. I think sometimes you can share on a deeper level, and it's easier to talk about things you love that work for you. Social Media – Social media is an excellent way to share affiliate links. Of course, you'll have to get straight to the point with limited characters available, but you can even share a blog post you wrote about an affiliate product. Just make sure you're sprinkling it in your social media marketing and not making it the sole focus. One word of caution when promoting affiliate links via social media. Some platforms, like Pinterest, do not allow promotion of affiliate links, so be sure to familiarize yourself with each platform's terms and policies before adding your links. Your Own Product – I don't think this method of affiliate marketing is used as much as the others mentioned previously, mainly because when people create their own products, they're usually focused on getting sales for that product. However, if you include a couple of appropriate affiliate links within your own ebook, course, or printable, you might find yourself earning a bit more than the monies from your own sale. Plus, if you're letting other bloggers become affiliates of your product, this could offset some of the costs that you will pay out to them. No matter how you decide to promote your affiliate links, be sure to follow the Federal Trade Commission's (FTC) guidelines that require bloggers to disclose all affiliate links. It's not enough to just have a disclosure page on your blog either; you need to have your disclosure in each and every post where you display links, and it should be before the actual link itself. You also want to make sure you're complying with Google. This means that all links that are paid should be nofollow. If you need more information about nofollow links, visit this page and this one. 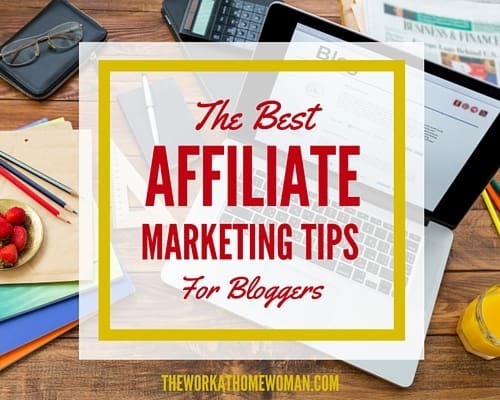 Do you know of any other important affiliate marketing tips for bloggers that we haven't mentioned? We'd appreciate you sharing in the comments! Thanks so much for the tips, as I am a beginner in affiliate marketing and will take heed to the advice. Less is more for sure in trying to advertise too much and money is time as time is money. Thank you so much for this post. It is really going to be helpful to me as I strive to have more income coming from passive activities instead of active ones. Great post! Lots of money making tips that everyone should try and use on their websites. I certainly will be using some of these tips on my blog. Thanks very much! Glad you enjoyed the tips, John. Glad you enjoyed the tips! What areas of affiliate marketing are you struggling with? Glad you enjoyed the affiliate tips, Bobby! Glad you enjoyed the affiliate marketing tips!